Stefan Asbury leads the Tanglewood Music Center Orchestra, George Xiaoyuan Fu on piano, and Genevieve Grenier on ondes Martenot Monday. LENOX — In recent summers the Tanglewood Music Center’s Festival of Contemporary Music has been, among many other things, a great place to catch the latest work of the superb British composer George Benjamin. In 2013, FCM delivered the US premiere of Benjamin’s operatic masterwork “Written on Skin,” in a memorable concert performance under the composer’s own baton. Lincoln Center did not get around to staging the opera until a full two years later. 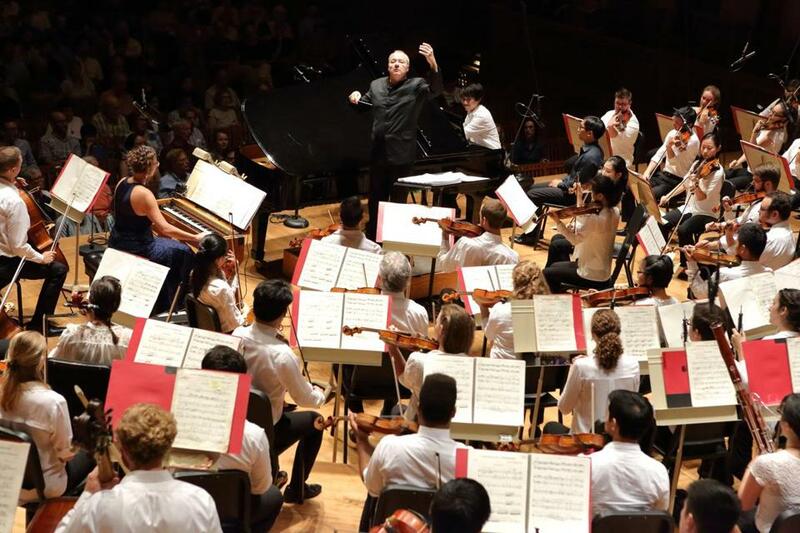 This summer — specifically, on Monday night — FCM once again capped its run with a significant American premiere of a new Benjamin work, performed by the Tanglewood Music Center Orchestra with the conductor Stefan Asbury. Co-commissioned by the BSO with several European partners, “Dream of the Song” is scored for countertenor, female chorus, and orchestra. Fans of “Written on Skin,” and its libretto by Martin Crimp, may recall that opera’s profound ways of opening up the geological layers of time, and hinting at the hidden strata of beauty and brutality on which the present moment stands. Indeed in that score, Benjamin’s exquisitely layered music itself becomes a metaphor for landscape as a palimpsest of history; or more tangibly, in Crimp’s unforgettable closing image, for the modern-day parking lot that is built on top of piles of the dead. In its length, scope, and initial impact, “Dream of the Song” arrives as a more modest work, but it shares many alluring qualities both musical and thematic. For this new work, comprising six songs, Benjamin has gathered poetic texts from the Andalusia region of Spain separated by almost 1,000 years. Pride of place goes to evocative 11th-century Hebrew poems by Solomon ibn Gabirol and Samuel HaNagid (set in English translation), yet these are powerfully contrasted with excerpts (set in Spanish) from Federico Garcia Lorca’s “Diván del Tamarit,” a collection that was itself written in tribute to earlier Arabic poets of the same region. The verses of late Lorca in particular, implicitly amplified by that poet’s gruesome fate in the Spanish Civil War, mark this song cycle as a work that is also engaged with a notion of art as an index to the layers of an invisible past. In sonic terms, “Dream of the Song” glitters and holds the ear. The composer’s precisely imagined writing for orchestra is a marvel of cool sensuality. The countertenor voice, sometimes haloed by the female chorus, is also deployed as its own special instrument, while the orchestra reflects, refracts, punctuates. Under Asbury’s astute direction on Monday, TMC fellow Daniel Moody was the brave and capable countertenor soloist; navigating a challenging choral part, the Lorelei Ensemble (Beth Willer, artistic director) sent up waves of iridescent sound. A new work by Benjamin is of course not easily parsed in a single hearing. Fortunately, BSO audiences will have an opportunity to hear “Dream of the Song” again in February when the orchestra performs it under Andris Nelsons’s baton, joined by Lorelei and countertenor Bejun Mehta, the singer for whom it was written originally. In keeping with this summer’s FCM theme of teacher-student connections, “Dream of the Song” was offered on a program with the “Turangalila-Symphonie” by Benjamin’s teacher, Olivier Messiaen. It’s a work long recognized as a landmark of postwar French music, famed for its coloristic extravagance, its grandiose spiritual sincerity, and its sheer massiveness of scale. Under Asbury’s tireless guidance, the TMC orchestra outdid itself, turning in a performance of stamina, finesse, and palpable commitment. George Xiaoyuan Fu impressively navigated the fierce demands of Messiaen’s ecstatically-charged piano writing, and Genevieve Grenier on ondes Martenot deftly silvered the various clouds of orchestral sound. All told, it was an uncommonly jubilant end to this year’s FCM, and the concert was capped by — what else? — an ovation commensurate with the night’s ambition.